.:. 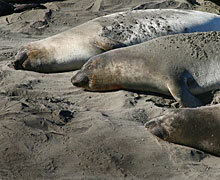 Hiking in Big Sur - Elephant Seals .:. Beginning in 1990, less than two dozen elephant seals began to call Piedras Blancas home, and now the seals are expanding to locations both north and south of the original beachhead. One of the biggest thrills on your trip up or down Highway 1 will be a stop south of Big Sur at the fascinating Piedra Blancas elephant seal rookery. Hunted nearly to extinction in the late 1800's, elephant seals have made a remarkable recovery after a small group of between 20-100 seals off the coast of Baja California survived. Today, they are a protected marine mammal, and their numbers are thriving! Nearly any time of year you will see activity on the beaches, finding elephant seals at different stages of breeding, birthing, molting and resting. One of most exciting times to visit is in the winter starting in December when sub-adult males return to the beach followed later by 5,000 pound bulls to establish their territories. Pregnant females also begin arriving, giving birth within days of landing on the beach. As January approaches, the beaches are packed with seals and the air is screaming with the bellows of booming, guttural grunts from the males, and squawks and squeals from mothers and babies. After mothers nurse their babies for a month they mate and then return to the ocean. It's during this time, generally around Valentines Day, that mating is peaking and males are in battle to protect their harems and territories. This show is testosterone laden as males rear up and slam their bodies together baring their huge canine teeth, bellowing threats, and drawing blood. Although the winter spectacle is the best time to visit, it's always worth a stop to see what's happening on the beach. Luckily, you will nearly always find knowledgeable and friendly docents outfitted in blue jackets, to answer any questions you might have about the seals. 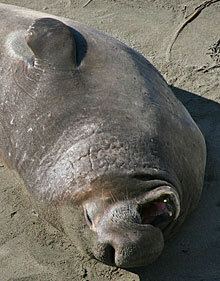 A large parking lot is available for visitors along with descriptive signs illustrating elephant seal biology. Be sure to visit both beaches flanking the north and south sides of the parking lot. On the south side, is the larger of the two beaches and an attractive boardwalk allows easy access over the bluffs to view the seals. On the north end, the beach has fewer seals, but the opportunity to get a closer look is better. Don't forget to bring binoculars and a hooded jacket. It often is very cool and windy, so layer up! There is a large and well graded parking lot just for elephant seal viewing. The entrance is easy to spot on the west or ocean side of Highway 1, 4.4 miles north of the Hearst Castle turnoff, or 11.6 miles north of the Windsor intersection in Cambria. Travelling south on Highway 1, the parking lot is 59 miles south of Pfeiffer Big Sur State Park, or just 1.4 miles south of the Piedra Blancas lighthouse. Please note: you cannot park along the highway near the elephant seals turnoff.  Elephant Seals for Photographers!